It started with a post I did about Willis Eschenbach’s mistaken claim about sea level rise at individual tide gauge stations, that they show steady rise at a constant rate, surely not speeding up (accelerating). Looking at data from 63 tide gauges around the world, Eschenbach said “NOT ONE of these 63 full tidal datasets shows statistically significant acceleration …” I showed that Willis was wrong, using exactly the same data he had used. To his credit, Willis didn’t keep insisting he was right about that. He still maintains that any acceleration you can find is unimportant (I disagree), but at least he didn’t insist that his initial analysis was right after it had been shown wrong. Your Boston graph is cut way too short, why did you do that? Data for it goes back to 1920s, and shows NO acceleration. The choice to use only data since 1950 was Willis Eschenbach’s, not mine, so he couldn’t criticize me for it (Eschenbach is, apparently, on “his side” — he seems to have divided us into “sides”). Perhaps that disappointed him. He followed with further comments, levelling further criticisms on further topics. If we’re going to argue about multiple issues, it’s only fair to take them one at a time. Since his very first claim was that Boston data “shows NO acceleration,” I decided to deal with that first, so I did yet another post about the Boston data specifically, this time using all of it. I showed, beyond a reasonable doubt, that the tide gauge data from Boston does show acceleration recently (and deceleration too, earlier), it’s definitely doing more than just following a straight line plus random noise. Now he could either provide counter-evidence, or drop that pretense and admit his mistake; then maybe we could move on to some of those other things. OK so assuming this is from sea level rise and not a local caused short term phenomenon, do a few other stations, like in Australia and Brest, France. Both very long measurements. So I did yet another post, about the data from Brest, France and Australia. I not only examined data from Brest, France and “a few other stations” in Australia, I even formed a composite of 81 Australian stations’ data. I also insisted that we deal with this issue — acceleration in tide gauge data — before moving on to others. There it was, acceleration (and deceleration). Maybe he would now be convinced? Then we could get to some of the other issues, having finished with this one? He attempted to refute my demonstration, in three ways. 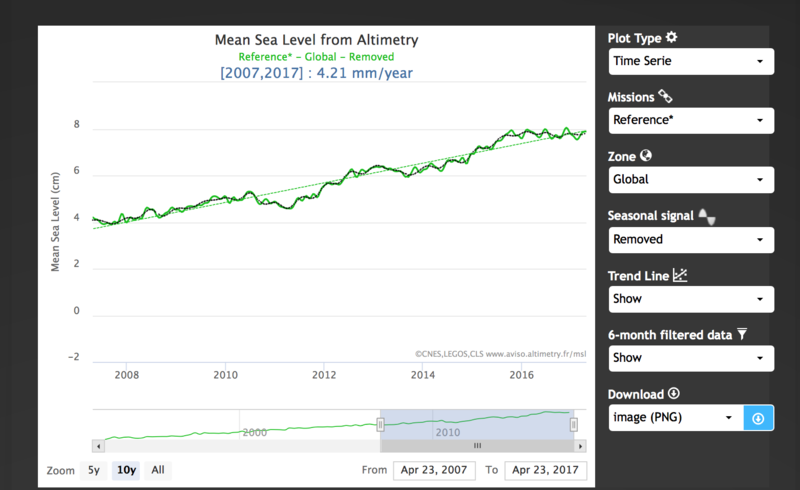 First, he linked to graphs (from NOAA) of some of those other stations, and said “Not even NOAA plots an accelerating curve through those.” Of course not; they didn’t try to, they make it quite clear that they’re just fitting a straight line (whether it’s following a straight line or not) to estimate the average rate of sea level rise over the whole record. Second, he linked to a paper by researchers who not only bungled their analysis, one of them has a history of just making up stuff. Third, he commented about some of those other issues besides tide gauge data from individual stations. He kept trying to turn the discussion to other issues. I wasn’t having it. Deal with the issues one at a time, and deal with this one before we get to the others. That’s not asking too much, and it prevents the kind of “discussion” where we can never make progress on anything because when one issue gets too “hot” for him, he just switches to another. Evidently he had no real evidence to offer, and wasn’t willing to admit the truth, and since I wasn’t allowing discussion of other issues while this one was still on the table, the frequency of his comments has dwindled. We’ve waited long enough, we’re done with him. 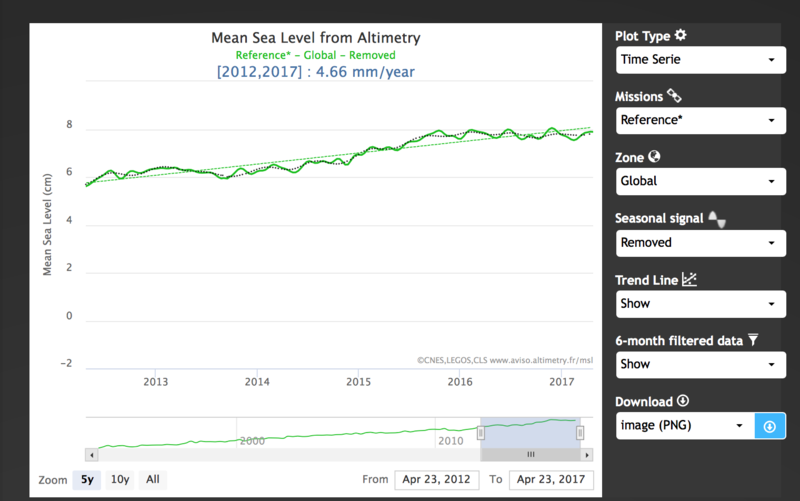 Why is he (and so many others) insistent on denying that sea level rise is doing anything but rising at a constant, unchanging rate? My opinion: because they don’t want us to do anything about man-made climate change. They can’t deny that sea level is rising — just ask the people of Miami. Every year when the highest tides come (around October) the streets flood; they didn’t used to but now do because of sea level rise. Undeniable. And it’s already costing; the Miami area is already spending about half a billion dollars installing pumps to keep the water off the streets. It’s going to get worse, because the sea will keep rising. We have every reason to expect that over the years to come it will rise even faster. The present rate, all by itself, spells trouble, not just for Miami but for major metropolitan areas around the world. The threat to Norfolk, Virginia (home to the largest naval base in the world) is enough that the U.S. Navy regards it as a threat to our military readiness. If it rises as far and as fast as the best evidence suggests, then by the end of the century the entire city of Miami will be under water. Trillions of dollars of real estate will be lost. That’s the kind of blow to the economy which will hurt everybody, although it will surely hurt the people who live there most. So those who want to do nothing about man-made climate change are determined to deny that sea level rise will do anything but keep going at its present rate. A few years ago the North Carolina state legislature even considered legislation (!) to require than any planning to deal with sea level rise could only consider its rising at the current rate, nothing faster. They quickly became a laughingstock. The present rate is bad enough — very bad — but expected future rates are devastating, the kind of trouble that gets attention. No more Miami. Denying acceleration of sea level rise also gives them something to criticize, namely projections of what future sea level rise might actually bring. By disparaging that, they cast doubt on the competence of climate change researchers in general, which of course serves their purpose to obstruct doing anything about it. Doubt is their product. There are some important lessons to be learned. Some deniers will never concede anything, even the obvious. No matter how many times they’re shown wrong, they’ll keep repeating the same nonsense endlessly. That’s why some of their “arguments” are better described as “zombie arguments” — even if you kill them, they just come back from the dead. Deniers tend to use the “change the subject” tactic — a lot. When the topic under discussion gets too hot for them, rather than admit any mistake they just switch to another. One of the most effective ways to counter denier propaganda is to force them to stay on topic. When they can’t change the subject to avoid it, they either devolve into ludicrous claims, or just go silent. The future of sea level rise is a complex issue. As the earth warms ocean waters expand due to absorbing more heat, and how much they do depends on how much the world warms. That depends on what we do. As more and more of the world’s land-based ice melts it adds more water to the oceans, and that’s something we have a very hard time anticipating. It’s complex, but we do know that there are very troubling signs that the great ice sheets in Greenland and Antarctica are starting to destabilize. If either one disintegrates, it’s goodbye to coastal regions and their billions of inhabitants. Human inhabitants. Alas, the deniers and the fossil-fuel industry have too many politicians in their pockets. Like Florida governor Rick Scott, who seems to have insisted that workers in his own state’s environmental protection agency not even mention the words “global warming.” Like Florida senator Marco Rubio, who denies the danger while the people of Miami are screaming for help from the state and national governments that are supposed to be protecting them. When you talk to politicians in south Florida, like the mayors of the cities being affected, they do not deny the danger. The people can see it, right before their eyes. And that’s another one of the problems — that people (including voters) don’t take the issue seriously enough unless it hits them in the face in their own home towns. The sad part is that by the time that happens, we’ve already wasted decades when we could have been working to reduce the damage. Because scientists have been warning us about this, for 30 years now. They say that “forewarned in forearmed,” but when early warning is discredited by know-nothings, too many people take the easy way out and set the issue aside. Instead of being forearmed, we end up disarmed, just when we most need to prepare for what’s to come. This blog is made possible by readers like you; join others by donating at Peaseblossom’s Closet. It’s wild how climate change deniers, Creationists, Apollo landing hoaxers, etc. all use the same rhetorical toolkit. It’s all the same pathology, just directed at different targets. Yes, and in my opinion at least, it has become the general template for the universe of “alternate facts” propagated for political gain. So, for example, a single Tweet establishes the ‘alternate fact’ that transgender troops impose a ‘tremendous cost’ on the US military. It may be debunked immediately, and even effectively, but it will never be acknowledged by those who emitted it (zombie argument)–though they may well change the topic to, oh, “Hillary’s crimes”, or the infernal machinations of European powers who designed the Paris Accord to “shackle” the American economy. The epistemological crisis has spread, badly. Maybe the CDC could help, if we weren’t already cutting their budget to the bone, too. I think it is interesting how some folks who think such simpleton models are good for forecasting far into the future, would never consider such a model for financial domains. One could eyeball a linear trend through the last 10 years of AAPL, but the whole series looks more like a AR() hockey stick–a linear trend looks inadequate, but “Buy” still looks like a good decision. Global Sea Level Rise is a buy on 10, 50, 100 year time scales, and the unsupportable advice of “Hold” or “Underperform” seems like these advisors must be trying to scam you. The subprime mortgage fiasco would tend to refute that statement. Many, many people in the industry knew that they were headed for a bubble burst with catastrophic implications, even at the loan officer level and lower. But ( and here is where the similarity comes into play) they were all making too much money to rock the boat, and like pigs at the trough, they ate their fill regardless of the consequences to others and even to the point of nearly destroying the world’s economy. You may be too kind. The carbon fuels industry knew in the 1980’s that they would have to fund a tremendous PR opinion manipulation campaign – clearly carbon fuels would need to be curtailed and MANY millions has been spent, continued spending to perpetuate dangerous commerce. This is beyond “know nothings” – One problem is that the 50 cent army of trolls is indistinguishable from the ideological fanatic base. I shall trust science and statistics – over Madison Ave PR campaigns… thanks for all that you do. The recent rate of SLR has remained above the trend since around November 2015, which appears to be record period of time for a departure either above or below the satellite era trend. If it’s not acceleration, what would acceleration look like? The 2nd 1/4 update 2017 for 0 to 2000 meter OHC indicates this departure above the satellite-era trend of 3.28 mm/yr may continue. Excellent and exhaustive refutation. Your analysis of the “strategies” climate deniers pursue is spot on. I wonder too, how much AGW-deniers think their marginal climate-change costs actually are. It’s not like most of them can’t afford to pay a few bucks more for a tankful of gasoline. Maybe they’re afraid someone will demand they pay their entire climate-change bill in arrears immediately or be executed? I’m not willing to pay my lifetime climate-change bill either, candidly; good luck collecting ‘reparations’. But suppose I, in a paroxysm of guilt for having socialized as much climate-change as the average American, convulsively donated my life savings to the families of the >45,000 Filipino casualties of Typhoon Yolanda. I’d still have my family, and Wakefield would still have his savings! I am willing to pay full price for my own comfort and convenience at time of purchase from now on, since I know I’ll pay for them one way or another eventually anyway. It won’t help, though, if I do and Wakefield doesn’t! I could be wrong about the pecuniary motives of AGW-deniers like Wakefield. They may have more idiosyncratic cognitive biases. Maybe they lie awake at night for fear of librul monsters under their beds. If they’re not rational, how can we expect to understand them? Mal: Marginal costs ALWAYS get paid eventually. Yep. By someone, if not by me. I am a long-time blogger that remembers commenters. Wakefield happens to be someone with convictions that straddle boundaries. For example, he once commented at the old TheOilDrum.com blog as jrwakefield, and like the majority there believed in the physical theory known as peak oil. There is absolutely nothing controversial about peak oil, because all it says is that crude oil is a finite and non-renewable resource. Read what Wakefield says about the topic and he makes perfectly cogent sense. If everyone on the planet had similar views on peak oil as Wakefield, we would be in a much better place. In contrast, when Wakefield argues the evidence for peak oil on WUWT, he gets massively assaulted by the contrarians there — as can be predicted. Yet, when Wakefield tries to apply the same critical thinking to AGW as he does to PO, he apparently does not see as striking an argument. To him, a SLH chart does not show the same strong inflection points as a peak oil chart from the UK North Sea does. Fot PO, Wakefield sees that we have likely tapped those oil reserves and are on the downslope and nothing is going to bring it back. Yet, he apparently does not feel the same confidence with AGW as a non-reversible process. I went back to one of my posts on The Oil Drum from 2007 http://www.theoildrum.com/node/3287 and noticed Wakefield commenting there with the same criticism of sea-level rise that he is leveling here. I would say the Mr. Wakefield may have a mental block here, but it is nowhere near the political psychosis of someone like Willis Eschenbach. As for me, I see the SLH acceleration but am more interested in the shorter-term variability, which is what I think we also need to understand fully. Wakefield seems to me to be unsophisticated in terms of data analysis. He relies on “by eye” fits, and seems to be of the opinion that if an analyst estimates a linear trend, they must think the trend is linear. A linear trend merely tells you whether the quantity is increasing or decreasing–and often, that is the purpose of estimating such a trend. What Wakefield shares with others among the denialati is a tendency to think his own inability to understand an argument means that the argument must be false. For those of you with denialist logical fallacy bingo cards, that’s argument from incredulity. It’s the Gish galloping that’s problematic – after Tamino did the analysis on Boston, Wakefield said, “well, what about Australia?”. So Tamino does an analysis on Australia, and Wakefield says, “well, what about [insert other paper here]?” He never engages on the analyses (except to say “it looks wrong” without explaining why he thinks so), but immediately switches to another topic. That’s not critical thinking, that’s blind contrarianism. Well, Wakefield hasn’t budged on his interpretation of sea-level rise in 10 years and he hasn’t budged in his belief in peak oil in that time either. So, in terms of a No-Regrets or Precautionary Principle policy, he is batting 0.500, which is why No-Regrets works — get off fossil fuels either because its a finite resource or because its harmful to the environment. Wakefield is in the former camp, which is better than be in neither. While Mr. Wakefield’s amateur scientific analyses may or may not lead him to the same answer reached by genuine experts, what’s obvious is that he’s not trained in the collaborative and competitive culture of science. He’s undeterred nevertheless, believing his flawed ratiocinative faculty alone qualifies to contradict the lopsided scientific consensus for AGW, and that them climate scientists with all their data don’t know nothin’. He seems not to acknowledge that he could be fooling himself. That is the Dunning-Kruger effect. Even when it’s harmless, it’s not respectable. At best, Wakefield is guilty of the ‘sin’ of vanity, i.e. pride. Christians, inter alia, hold pride to be the deadliest sin, for it enables all others. So long as carbon dioxide levels remain about 400 ppm the sea level will equilibriate at around 25 meters higher than now. This agrees with the paleodata from the mid-Pliocene with carbon dioxide concentrations about the same as now. Is there too little data to ask if the acceleration is accelerating? But you don’t have to get all the way to the apocalypse before life begins to get markedly less comfortable. 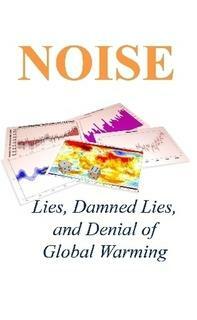 Sounds like a CAGW alarmist to me ;^)! With my sincere respect, I’d read your book if it was free. It’s likely to be over my head, but I just ordered it anyway, thanks! Will share with Dad who might enjoy it. Very low price! It raises a quibble I’ve had: between those who conclude we are only to have 1 foot rise by 2100 and others (including Hansen) who suggest over 10 feet and decades sooner. Like supporting pragmatic Democrats and hardworking public servants instead of all or nothing firebrands, this leaves me between the devil and the deep blue sea. Still, is this a question about which anyone here has an informed opinion (1 foot versus 1.5-6 feet SLR as per IPCC)?